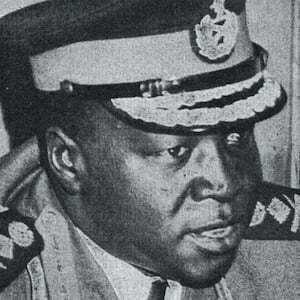 Political leader who became the third President of Uganda from 1971 to 1979. He was a military dictator whose rule was characterized by human rights abuses, political repression, and ethnic persecution. He was from a poor rural one-parent family and went into the British colonial army with nothing more than a fourth grade education. His regime killed approximately 100,000 to 500,000 people. He married at least five women as a polygamist; he married his first two wives in 1966. He fathered thirteen children. For his portrayal of him in the film The Last King of Scotland Forest Whitaker won the Academy Award for Best Actor.